I finally decided what to do with the Color Block that’s been sitting on my sewing table, waiting for me to make something with it. I love the way it turned out. Its the first quilt I’ve ever made that felt like I was making artwork and not just a quilt. 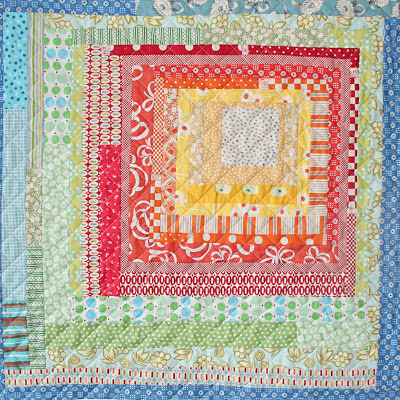 It has pieces from all of my favorite fabrics, most of which have been discontinued, in all my favorite bright colors. A lot of time and thought went into this, but I think even more time has been spent just staring at it. Its kind of hypnotizing. :) I straight stitch quilted it with lines 1 1/2″ apart. This will probably end up in the shop, if I can bear to part with it. ps. I’m keeping it, especially with your sweet comments telling me to KEEP it!!! And even my husband said keep it……. can’t argue with that!!! oh you HAVE to keep it. you said yourself it has your favorite fabrics in it. consider it your valentine’s gift to yourself. Don’t sell it, keep it!!! It is so gorgeous. How big did it end up being? Oh oh oh! Your work just kills me. Something about your design and aesthetic just resonates with me. Gorgeous and thank you for sharing, as always. I love it, it is so pretty and if it has your favorite fabrics then you just can’t possibly let it go! Love it!! You are very inspiring!! Thanks for sharing your mind! Gorgeous! I’m not sure i’d be able to give that up either. Pretty pretty pretty pretty! So glad you’re keeping it! Beautiful! 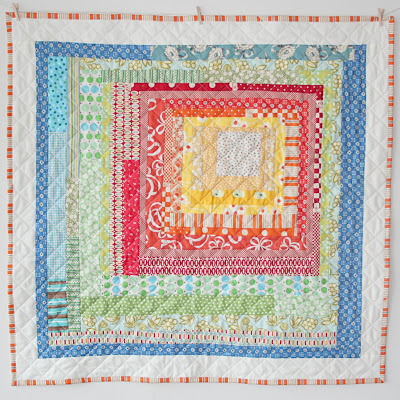 Love the graduality of colors and the idea to do a quilt with only one gigantic log cabin. Yay, I’m happy to see you decided to keep it! It’s so lovely! 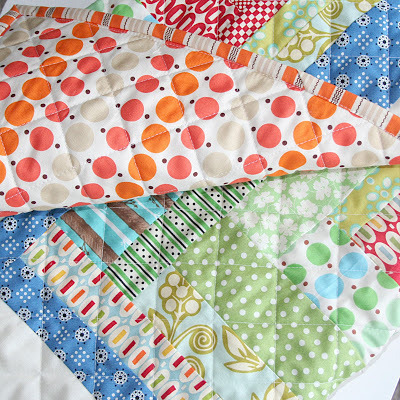 I have always wanted to make a large log cabin quilt, and I love how you did this one with the color block. Girl! I just love your creativity! I’m so glad you’re keeping this quilt! Just want to say, “thanks” for inspiring me to learn to quilt. I posted a link to your camera strap tutorial on my blog. I made one for myself and also for a friend’s b-day…so cute! Can’t wait to see what else you’re working on. Yep – keep it. It’s pure happiness! It is pretty. Glad you’re keeping it. Can’t argue with that! Lovely fabrics, very retro graphic look. Can’t wait to see what you do next. Oh I LOVE this. I have to make one just like it. I LOVE it!!! Come visit my blog and find out how you can help Mountain Baby Blankets send blankets to teen moms in Appalachian Kentucky. This is just amazing! I’m glad you’ll be keeping it – what a wonderful heirloom! This is SO cool. 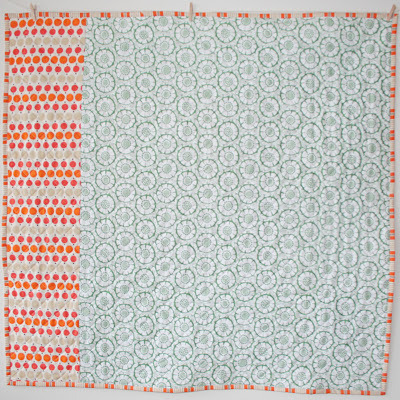 I just found your blog through sew mama sew and LOVE your boy’s quilt and this one. I want to make a pillow based on this design now! What size is this quilt – it is so great. I’m glad you decided to keep it. 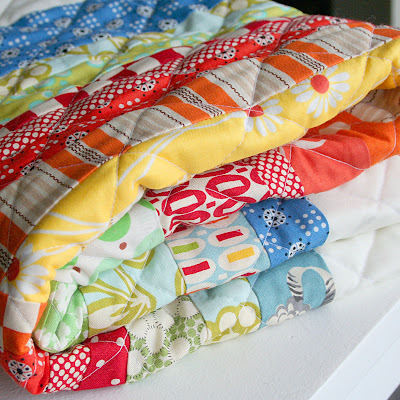 I love your quilts: how do you quilt such straight diagonals?? I am new to this, and you may have explained in another post, I just found your blog today: I love the diagonals, do you have a tutorial? how large is this quilt? This quilt is beautiful!! I did a version and posted on my blog along with a link to your site. You can see it here. I know I'm a couple of years late, but just saw this on Pinterest and realized this is the PERFECT idea for what I've been wanting to do, which is make a quilt for myself out of all of my scraps I've used to make quilts for other people. I was trying to figure out a semi-cohesive way to put all of those crazy fabrics together and this is it!! Glad you decided to keep it. It is very pretty. think i maght make one for our bed.